We are a professional, family run coach transport & travel provider based in Ireland’s premier tourist destination Killarney, Co. Kerry but operating nationwide for since 1969. As a group, O’Callaghan Coaches provides a one stop shop when it comes to luxury transport and travel. We can provide luxury passenger vehicles for sale, hire or even a chauffeured vehicle for a trip. 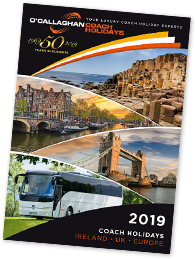 Our travel operation also provides an airport transfer service and a number of scheduled coach holidays and trips across Ireland, the UK and Europe as another alternative for people to travel to their favourite places. In 2019, we have redeveloped our event travel service, taking people all over Ireland to all their favourite concerts and sporting events. We are also Ireland’s leading supplier of custom built luxury VIP passenger transport vehicles. Our professional fleet of coaches and touring vehicles are of the highest standard and guarantee an enjoyable, smooth and safe journey. We have a young enthusiastic team of experienced transport and logistical professionals working across all service areas and the company is run by Phillip, Eamon and Catriona Callaghan who took over the reins from their parents James & Lena O’Callaghan. We also have a large professional team of highly trained, experienced and extremely friendly drivers. Some of our drivers are also fully qualified and Bord Fáilte approved Tour Guides and can add a wealth of knowledge and information to any trip. Catriona, Philip and Eamon are also involved in Elite Events (www.eliteevents.ie) where with a very successful partnership with Oliver Kirwan produce and own Run Killarney (www.runkillarney.com), Quest adventure series (www.questadventureseries.com), Ring of Beara Cycle (www.ringofbearacyclekenmare.com) and an ever growing portfolio of events.